As an incentive for everyone to head on over to the VEGAN CHICKIE site, I’ll be giving away a copy of Jonathan Safran Foer’s “Eating Animals”. 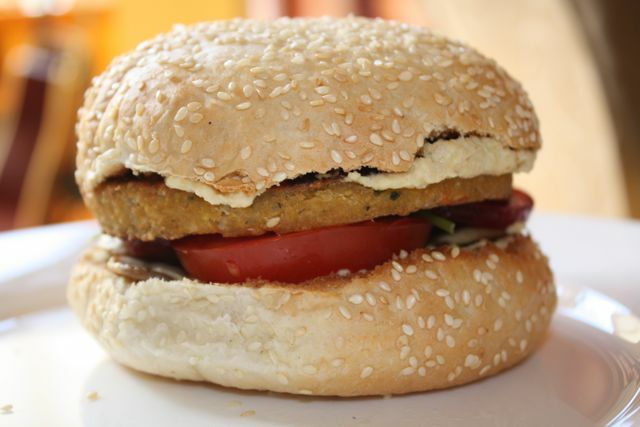 Just go to the giveaway post at Vegan Chickie and comment to go in the running. I’ll be drawing a winner on the morning of Wednesday 16th Dec (local NZ time). Don’t forget to update your links and bookmarks while you’re there! Please update your links/rss feeds/bookmarks so that you don’t miss out on anything! I’m a bit sad to say goodbye to this space, and to say goodbye to my nearly 6000 views (I was so excited to get to 10,000, but now we’ll be starting all over again! SO! 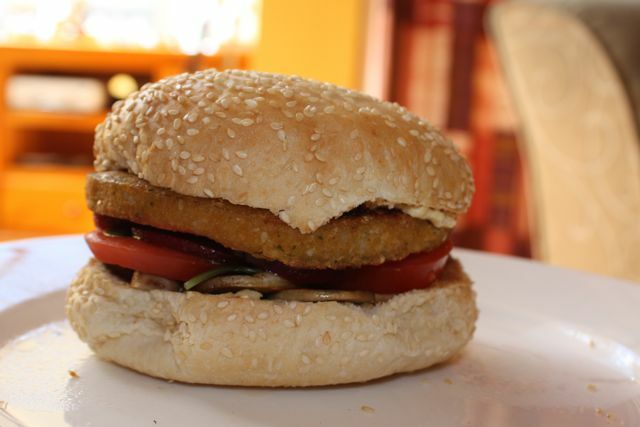 To help us out, come over to Vegan Chickie, have a look around, leave a comment and visit often so we can get back the ground we lost! This is another one of those dishes that is SUPER yummy but somehow looks kinda yuk when you take photos of it, but I promise you, it’s very delicious! And quiet easy too despite all the different pans you will use! 1. Quarter and deseed the capsicum and place it skin side up on a non stick baking tray. 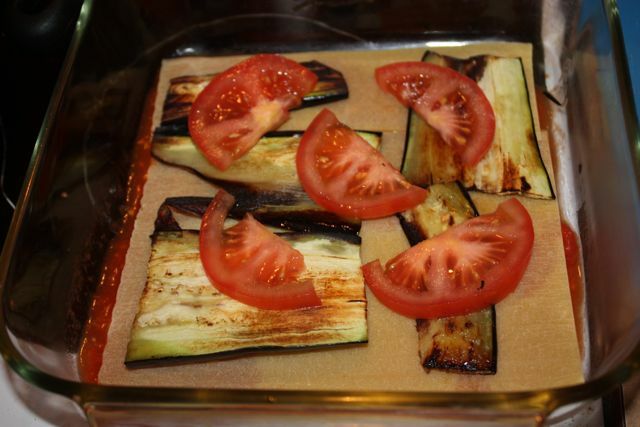 Place in the oven on high until skin blisters and blackens – about 20 minutes. 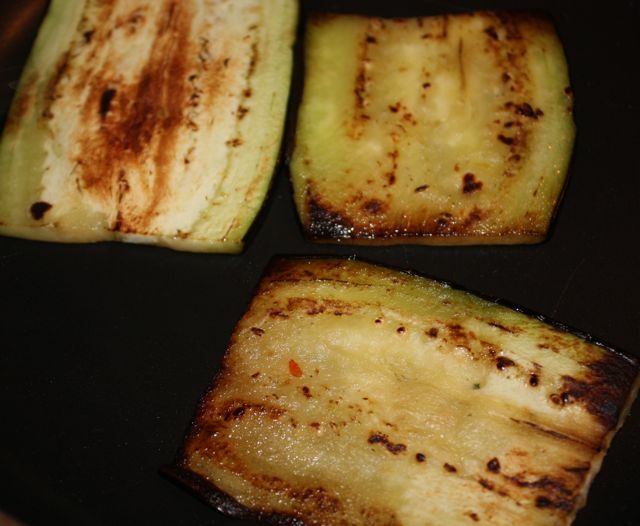 Remove and discard the blackened skin and slice capsicum into thin strips. Reduce oven head to 180 degrees. 2. 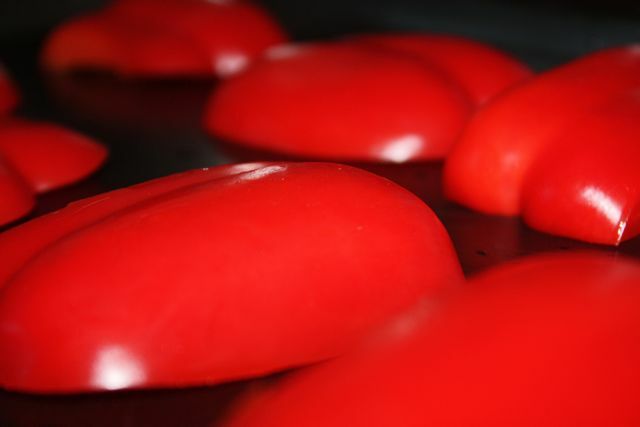 While the capsicum is roasting, make your tomato sauce: in a medium sized pan, on low heat, heat 1/2 tablespoon of olive oil, add garlic, browning for 30 seconds before adding the tinned tomatoes, chilli, stock cubes and fresh herbs. Leave the pan on low heat, stirring occasionally for 30 minutes. 3. 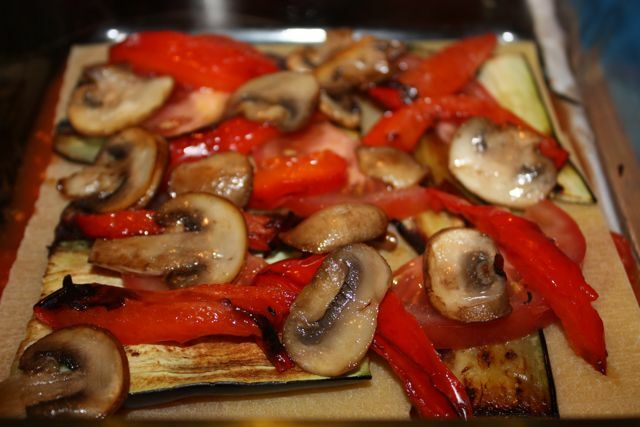 While the tomato sauce is cooking, in a small fry pan and using the rest of the olive oil in batches, brown 8 of your mushrooms, the eggplant and the zucchini. Set vegetables aside. 4. 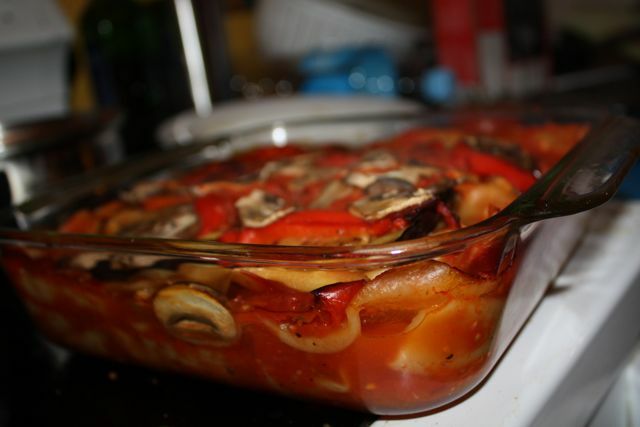 In a baking dish, place half a cup of your tomato sauce mixture and then place one layer of lasagne sheets on top. 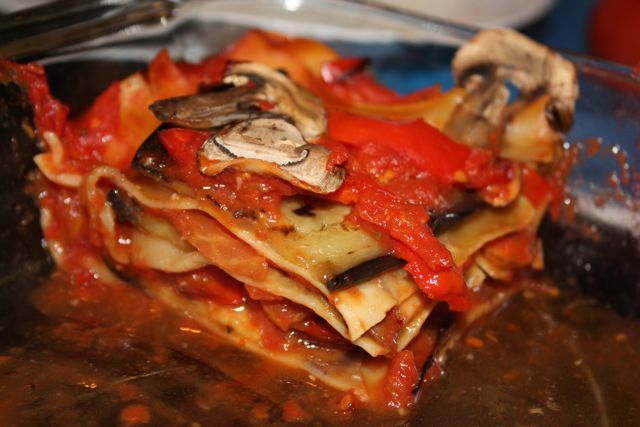 top with 1 third of each of the capsicum, mushrooms, eggplant, zucchini, fresh tomatoes and then 1 third of the remaining tomato sauce. Repeat until all your ingredients are used up. 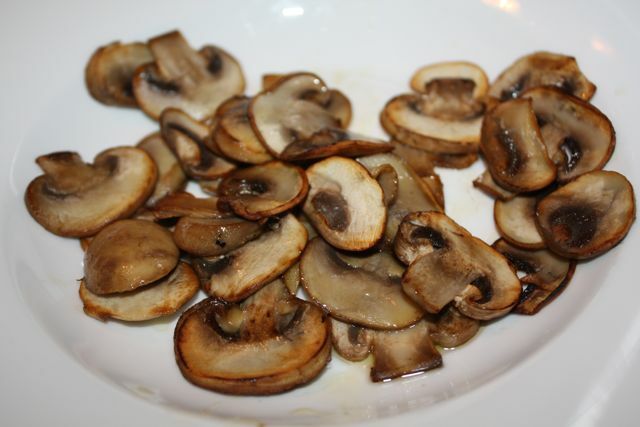 Top with the remaining uncooked mushrooms. 5. Bake, covered, in the oven at 180 degrees for 50 minutes, and then uncovered for a further 10. I thought I might take a bit of a break from the recipes today to share with you some of the sites and info I’ve been reading in the last week or so. Over the last few weeks I’ve started to realise that it’s not enough simply to not participate in the culture of cruelty, sometimes it’s just as important to provide people with information so that they can make an informed choice about their eating habits, SO, in that spirit I thought I would do a weekly or fortnightly post with some interesting links, blogs etc. This video was the “light-bulb moment” for my husband, who has always been a very avid meat eater, he always picked on me for my tendency to anthropomorphize animals, but then he saw this video and he hasn’t eaten meat since. Of course there is the documentary “Earthlings” which I highly recommend, even though I’m still having nightmares after forcing myself to watch it. I know it’s hard to watch, but as I said to a friend of mine the other day who said she just couldn’t watch it, closing my eyes doesn’t make the cruelty any less true. If you aren’t able to watch it, imagine how it must be to live it. Here is a Thanksgiving Ad by Peta, in light of the fact that it is Thanksgiving. I have a lot of issues with Peta and a lot of their approaches to vegan education – in particular the way they exploit women – but I do quite like the simplicity and sincerity of this advertisement so I thought I would include it. And you all know by now that I think everyone (in the world!) should read Jonathan Safran Foer’s Eating Animals, even if you have no interest in veganism, it is still such an important read, please read it! Okay that’s it for this week. I’ll come back next week with anything interesting I find between now and then! PS: Just a note, I will not link anything graphic without a warning either before or directly after the link, I am VERY sensitive about that kind of thing so I wouldn’t ambush anyone that way, however, some of the sites I’m linking to may have graphic pictures in their headers or sidebars, linking to various things around their sites, so tread carefully if you are likely to be easily offended. 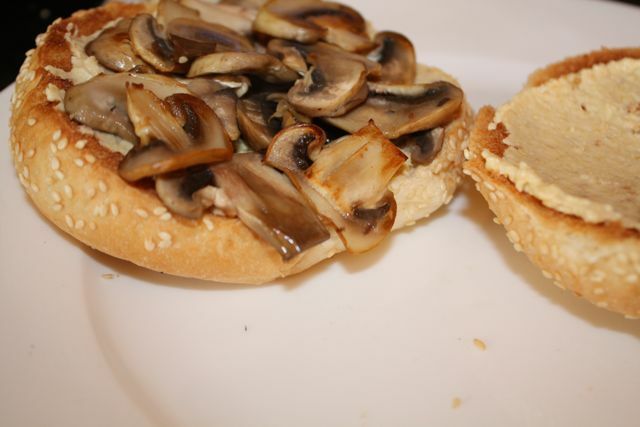 Slice the burger bun in half and toast or grill it until brown, spread hummus on both toasted sides. 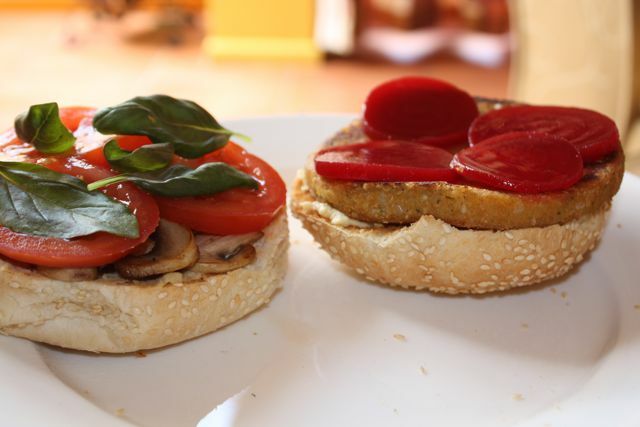 In a small pan, fry your mushrooms in a little oil, place them on one side of the burger, top with sliced tomato and fresh basil leaves, sprinkle with salt and pepper, then add the beetroot and the burger patty. Put the top on and you’re all done. 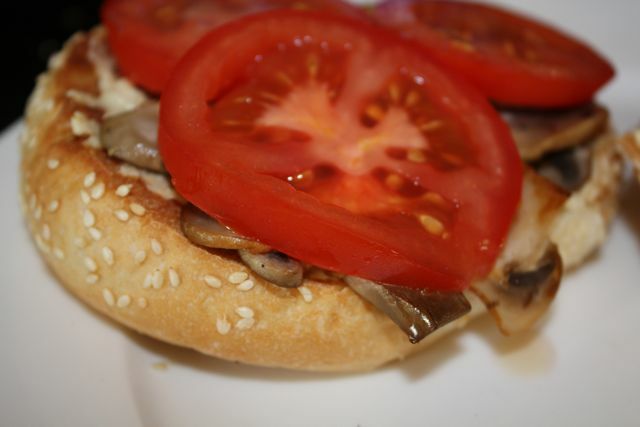 If I’m having this for lunch I’ll have it as is, for dinner I usually serve it with salad and fries or chips. 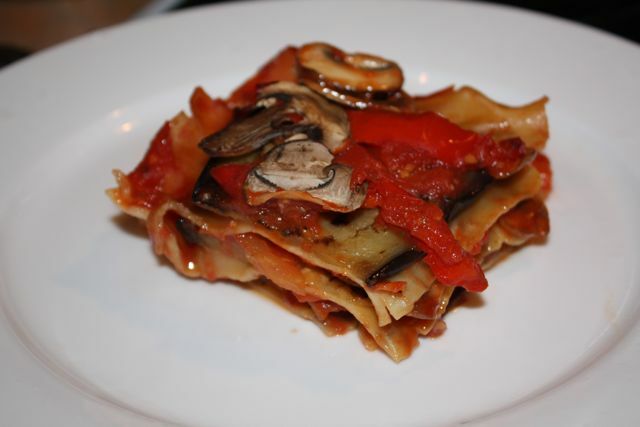 It’s a really simple meal that doesn’t take a lot of time, and it’s super delicious too.